The small hill of Morro do Careca which overlooks the radiant sea, offers a good place to trek through Balneario Camboriu’s green pathways and natural beauty. The place is known for a range of activities including Paragliding and you will often find amateurs and professional practicing the sport at the top of the hill. If you are game for it, you can take the paragliding experience with you as you unravel another one of the city’s many secrets. Carry bottled water and snacks if you plan a long visit. Don’t forget to wear sunscreen and sturdy shoes along with comfortable clothes. How popular is Morro Do Careca? People normally club together Praia Do Pinho and Acqualandia while planning their visit to Morro Do Careca. Amazing place, amazing - and tiring - walk, but it's totally worth it and free. Amazing place. I just think they charge a high tax to enter through a car... for small cars the tax is around 3.000 pesos. 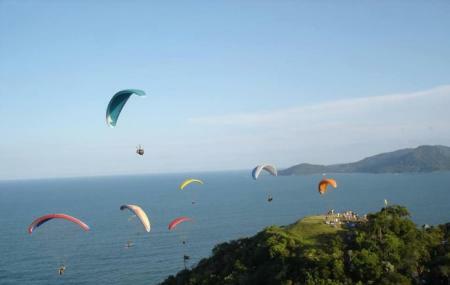 Morro do careca (bald mountain) is a perfect place for paragliding, to view beautiful landscapes including Atlantic Ocean, Praia Brava (Angry Beach) and Balneario Camboriu. If you like challenge, climb the bald mountain on foot! On the top, you have water, AÇAI (Amazing Brazilian fruit, similar to an ice cream, very refreshing). I really recommend it! Have a good one mate!